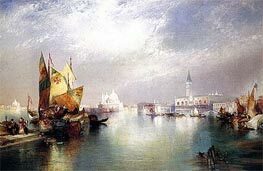 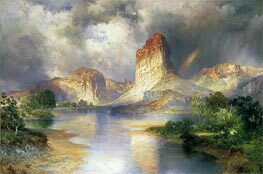 Thomas Moran (February 12, 1837 - August 25, 1926) from Bolton, England was a painter and printmaker of the Hudson River School who often painted the Rocky Mountains. 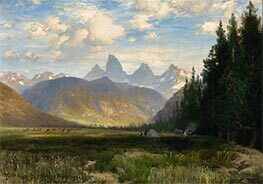 Thomas Moran along with Albert Bierstadt, Thomas Hill, and William Keith are sometimes referred to as belonging to the Rocky Mountain School of landscape painters because of all of the Western landscapes made by this group. 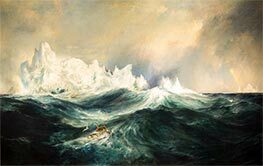 Moran's family emigrated from England in 1844 and settled in Pennsylvania. 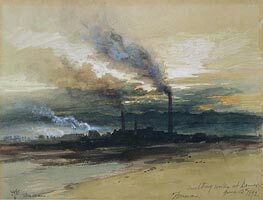 He began his artistic career as an teenage apprentice to the Philadelphia wood-engraving firm Scattergood & Telfer. 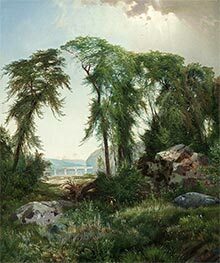 After two years of training, he produced illustrations and works in watercolour and began developing lithographs of landscapes around the Great Lakes in the 1860s. 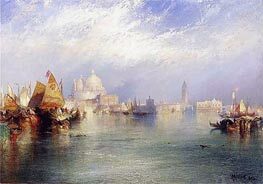 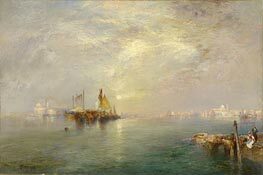 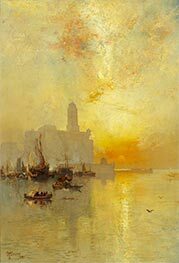 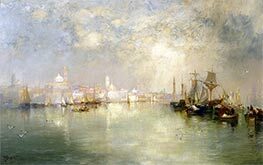 Moran was introduced to the work of J. M. W. Turner while studying in England in 1862, and acknowledged Turner's influence on his use of color and choice of landscapes. 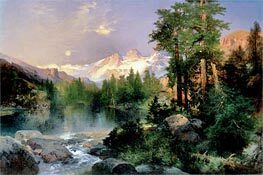 During the 1870s and 1880s Moran's designs for wood-engraved illustrations appeared in major magazines and gift oriented publications. 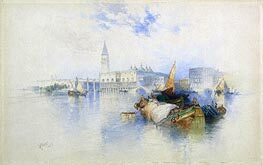 Moran was married to Scottish born Mary Nimmo Moran (1842-99), an etcher and landscape painter. 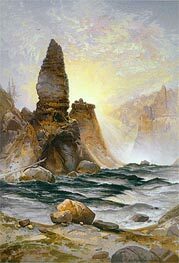 The couple had two daughters and a son. 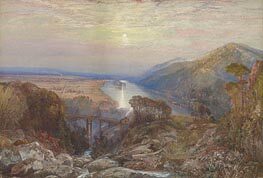 His brothers Edward (1829-1901), John (1831-1902) and Peter (1841-1914) were also active as artists. 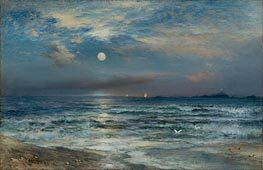 He died in Santa Barbara, California on August 26, 1926. 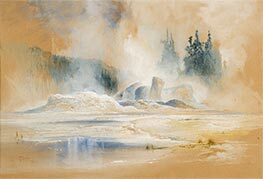 Thomas Moran's vision of the Western landscape was critical to the creation of Yellowstone National Park. 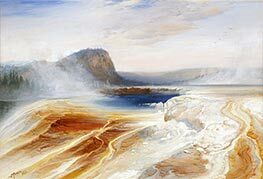 Moran's pencil and watercolor field sketches and paintings captured the grandeur and documented the extraordinary terrain and natural features of the Yellowstone region. 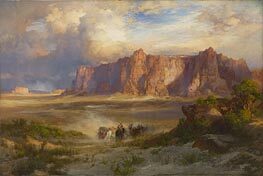 Moran's artwork was presented to members of Congress by park proponents. 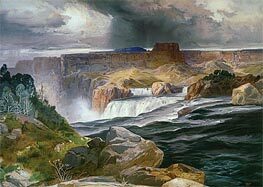 At the request of American financier Jay Cooke, and at his own expense, Moran agreed to join the the survey team of the Hayden Geological Survey of 1871 in their exploration of the Yellowstone region. 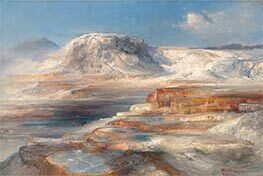 During forty days in the wilderness area, Moran visually documented over 30 different sites and produced a diary of the expedition's progress and daily activities. 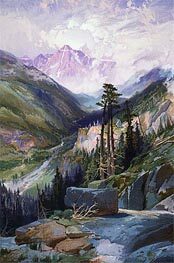 His sketches, along with photographs produced by survey member William Henry Jackson, captured the nation's attention and helped inspire Congress to establish the National Park System in 1916.